I've been at press days & meetings today so I've been running around central London like crazy. This is a pre-prepared post so I do apoligse for the weather innapropirate look! It's been so ridiculously warm today I avoided using tubes and buses were possible! I don't know how Im going to cope when Im on Holiday as to me it's been unbearably hot! Anyway, I wasn't going to post this look as I took it about a month ago as reserve stock but decided to post it today as I had no time. 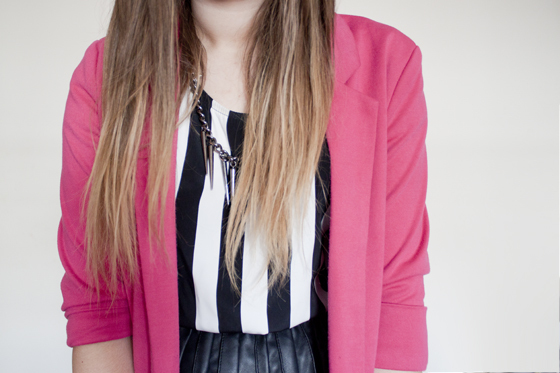 I feel a bit like a liquorice all sort with the monochrome stripes and the pink blazer but somehow it seems to work! I actually forgot I had this pink Missguided blazer so it was a nice rediscovery considering it fits well with my love of neon's and colour pops! This post is a great example of why you're such a great blogger! On trend statement necklace, nail art and ombré hair. Love!! Lovely post! and i'm loving the jacket! I have a neon pink blazer but mine was from topshop last year and I'd forgotten how lovely it is to wear! love the jacket! i'm stuck inside revising, so was a nice break to see your blog!! awesome look, best so far! Lovely as always <3 The top and the skirt are amazing together! Lovely outfit, I get what you mean about an allsort - but it works! I'm finding it ridiculously hot too, no idea how I'll cope on holiday but I do love the heat. Just not used to it in Scotland I guess! I've been looking for a pink blazer for the longest time, super cute. Love ow you've styled it with the skirt...plus Primark...who knew! I love this outfit, the jacket is so brill! I can't believe that skirt is from Primark! Love that Primark leather skirt, such a bargain find and love black and white stripes paired with the fushia pink jacket! love the blazer, and the skirt! you're bracelet is really nice too, where's it from? Great outfit, I really like the blazer. I love how you paired a striped top with your bright blazer and pleated skirt! You look really cute here. The weather has been unbearably hot over here too. I'm not the biggest fan of Summer, though, so I'm a bit biased. I love the blazer and stripes, absolutely gorgeous! I'm really bias about the necklace tho as I have it too and I adore it! You look gorgeous! I love this! your nails are so simple but so fabulous! Everytime I read your blog I tell myself I must remember to paint my nails more often! Yours are always perfect. Hey Lily, i really like that outfit! I've been reading your blog for 2 years now and i must say i love it! Loved the combo of the black-and-white dual with the pink. Lovelly. lovely outfit, love the pop of color! Ah, I wish I had your life. Press days and meetings sound like a dream. I love that pink blazer. So bright and summery! That reminds me... I should really go outside.